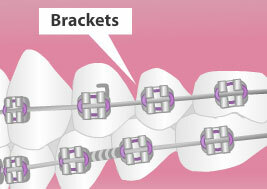 The application of braces moves the teeth as a result of force and pressure on the teeth. There are traditionally four basic elements that are used: brackets, bonding material, arch wire, and ligature elastic (also called an “O-ring”). The teeth move when the arch wire puts pressure on the brackets and teeth. Sometimes springs or rubber bands are used to put more force in a specific direction. Braces have constant pressure which, over time, move teeth into the desired positions. The process loosens the tooth after which new bone grows in to support the tooth in its new position. This is called bone remodeling. Bone remodeling is a biomechanical process responsible for making bones stronger in response to sustained load-bearing activity and weaker in the absence of carrying a load. Bones are made of cells called osteoclasts and osteoblasts. Two different kinds of bone resorption are possible: direct resorption, starting from the lining cells of the alveolar bone, and indirect or retrograde resorption, which takes place when the periodontal ligament has been subjected to an excessive amount and duration of compressive stress. Another important factor associated with tooth movement is bone deposition. Bone deposition occurs in the distracted periodontal ligament and without bone deposition, the tooth will loosen and voids will occur distal to the direction of tooth movement. When braces put pressure on teeth, the periodontal membrane stretches on one side and is compressed on the other. If this movement is not done slowly then the patient risks losing his or her teeth. This is why braces are commonly worn for a year or more and adjustments are only made every few weeks. A tooth will usually move about a millimeter per month during orthodontic movement, but there is high individual variability. Orthodontic mechanics can vary in efficiency, which partly explains the wide range of response to orthodontic treatment.